We offer a wide range of Digital Readout Systems, Measuring Tools and Metrology Tools; including product ranges from Moore & Wright, Bowers, Mitutoyo and Easson. 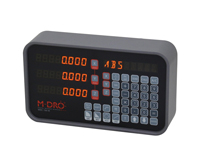 Our Digital Readouts are perfect for machine tools and woodworking machinery. We can provide UKAS Certification if required - please contact us to enquire. If you have a specific requirement then call or email our customer service team who will help you find the right equipment for you. You can also view our video gallery for useful guides on our various Digital Readout Systems. We ensure that all of our products meet the highest quality standards and are sure you will find the perfect tool for you. Established in 2003, Machine DRO is a family run business primarily focused on providing strong customer service and value for money. We offer a wide range of quality affordable DRO Systems, Measuring Tools and Woodworking Machinery to meet virtually any requirement or application.